I recently found myself plagued with the decision to replace an expensive appliance: the refrigerator. The existing one just wasn't cutting it anymore but I knew this big-ticket buy would make a serious dent in our bank account. When the time came to pull the trigger on this pricey purchase, I took on the challenge of finding as many money saving ideas as possible without sacrificing quality and style. In the end, I saved approximately 17 percent and am extremely pleased with the look, features and price of our new refrigerator. With so many brands, models, sizes and features to choose from, shopping for refrigerators can get confusing. Prices range anywhere from $400 to thousands of dollars, so evaluate the layout of your kitchen to determine the optimal size of refrigerator for your home. Then, research which model and features are most important to you -- do you prefer top or bottom mount, side-by-side or french-door styles? If you're unsure what I am talking about, then it's time to do some homework! Now that you have an idea of what refrigerator is best for your home and family, price it out at big-box stores like Sears, Lowe's, Best Buy and The Home Depot. Purchasing at such retailers gives you the greatest chance to score discounts and get free delivery and installation. To avoid driving around town, compare prices online first using a site like PriceGrabber. Some retailers may offer to price-match a competitor's lower offer, so use your research as leverage in the negotiation. Gift cards are not only great gifts for friends, they're great gifts for you, too! Once you determine from which retailer you're buying the refrigerator, check GiftCardGranny.com to find the highest discounted gift card for that store. Purchase as many gift cards as you can to cover the estimated cost of the new appliance. You can score discount gift cards of up to 10-percent off the face value, meaning you score an automatic 10-percent off your purchase. Matching coupons with sales can drive the price of any purchase down further, but finding those deals and staying up on the retailer's latest offers can seem daunting. To make it simple, sign up to receive retailers' e-newsletters or follow them on Facebook or Twitter for updates on upcoming promotions or exclusive discounts. Don't forget to check your physical mailbox, either; I found a coupon for $25 off at Lowe's and waited until my coveted appliance went on sale for an additional 10% off. Yay! With a stack of coupons and discount gift cards, the tally of savings can get confusing. Be patient with the cashier but make sure he or she doesn't miss a discount by thoroughly reviewing your receipt. Hold on to remaining gift cards to put toward the balance of a future purchase, or sell them for some cash back. Maisie Knowles is a working mother of two with three-year's experience writing on parenting and partner issues. She co-founded Kinoli Inc. with her husband in 2005 and currently spends most of her time at home with her two young girls. 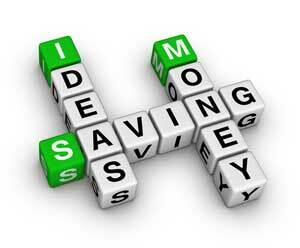 Do you have any tried and true money saving ideas for purchasing big ticket items? I’ll be using these soon, as our fridge is on its last leg.